2 | BROADBAND COMMUNITIES | www.broadbandcommunities.com | JULY 2017 EDITOR'S NOTE Broadband Communities (ISSN 0745-8711) (USPS 679-050) (Publication Mail Agreement #1271091) is published 7 times a year at a rate of $24 per year by Broadband Properties LLC, 1909 Avenue G, Rosenberg, TX 77471. Periodical postage paid at Rosenberg, TX, and additional mailing offices. POSTMASTER: Please send address changes to Broadband Communities, PO Box 303, Congers, NY 10920-9852. CANADA POST: Publications Mail Agreement #40612608. Canada Returns to be sent to Bleuchip International, PO Box 25542, London, ON N6C 6B2. Copyright © 2017 Broadband Properties LLC. All rights reserved. CEO Barbara DeGarmo / barbara@bbcmag.com PUBLISHER Nancy McCain / nancym@bbcmag.com E D I TO R - I N - C H I E F Masha Zager / masha@bbcmag.com E D I TO R -AT- L A R G E Steven S. Ross / steve@bbcmag.com ADV ER T ISING SALES ACCO U N T E X E C U T I V E Irene Prescott / irene@bbcmag.com E V E N T S CO O R D I N ATO R Dennise Argil / dennise@bbcmag.com CO M M U N I T Y N E W S E D I TO R Marianne Cotter / marianne@bbcmag.com DESIGN & PRODUC T I O N Karry Thomas CO N T R I B U TO R S Rollie Cole, Sagamore Institute for Policy Research David Daugherty, Korcett Holdings Inc. Heather Burnett Gold, Fiber Broadband Association Joanne Hovis, CTC Technology & Energy Michael A. Kashmer, Digital Broadband Programming Consultant W. James MacNaughton, Esq. Christopher Mitchell, Institute for Local Self-Reliance Henry Pye, RealPage, Inc. Bryan Rader, UpStream Network Craig Settles, Gigabit Nation Robert L. Vogelsang, Broadband Communities Magazine B ROAD BAN D PRO PE R TI E S LLC CEO Barbara DeGarmo V ICE PR ESIDEN T, BUSINESS & OPER AT I ONS Nancy McCain CHAIR MAN OF T HE BOAR D Robert L. Vogelsang V ICE CHAIR MAN The Hon. Hilda Gay Legg BUSINESS & EDI TOR IAL OFFICE BROADBAND PROPER T IES LLC 19 09 Avenue G • Rosenb erg, T X 77471 281. 342.9 655 • Fa x 281. 342.1158 w w w. bro adb andcommunities .com masha@bbcmag.com T he Fiber-to-the-Home Top 100 list is one of the biggest projects the Broad B and Communities team tackles each year. We sift through an enormous amount of information before deciding which companies to list and what information to include about each one. 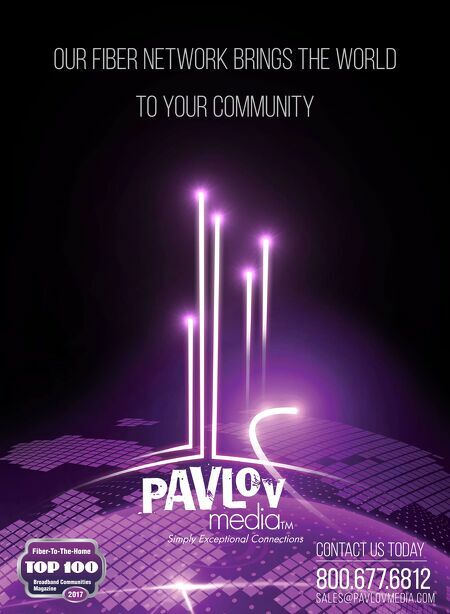 As you can imagine, there are many more than 100 great FTTH companies. For us, the result is more than the list you see in this issue; it's gaining a panoramic view of the industry. Certain themes come up again and again, with variations each time. e most pervasive theme is the unstoppable growth in bandwidth demand – but, of course, that wasn't news to us and probably isn't to you, either. Another of this year's major themes, the shift from hardware to software, is discussed in more detail in the Bandwidth Hawk column. In the enterprise IT world, virtualization was seen as a way to cut costs and simplify network management. In telecom, it's turning out to be a way to add services – and therefore revenues – quickly and easily. On an FTTH network, the number of services that can be added is nearly infinite. 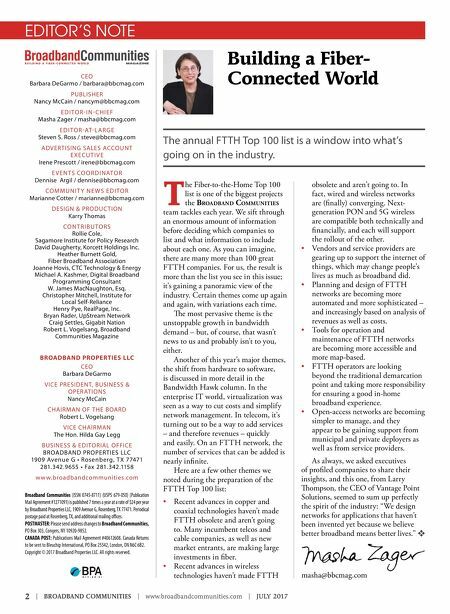 Here are a few other themes we noted during the preparation of the FTTH Top 100 list: • Recent advances in copper and coaxial technologies haven't made FTTH obsolete and aren't going to. Many incumbent telcos and cable companies, as well as new market entrants, are making large investments in fiber. • Recent advances in wireless technologies haven't made FTTH obsolete and aren't going to. In fact, wired and wireless networks are (finally) converging. Next- generation PON and 5G wireless are compatible both technically and financially, and each will support the rollout of the other. • Vendors and service providers are gearing up to support the internet of things, which may change people's lives as much as broadband did. • Planning and design of FTTH networks are becoming more automated and more sophisticated – and increasingly based on analysis of revenues as well as costs. • Tools for operation and maintenance of FTTH networks are becoming more accessible and more map-based. • FTTH operators are looking beyond the traditional demarcation point and taking more responsibility for ensuring a good in-home broadband experience. • Open-access networks are becoming simpler to manage, and they appear to be gaining support from municipal and private deployers as well as from service providers. As always, we asked executives of profiled companies to share their insights, and this one, from Larry ompson, the CEO of Vantage Point Solutions, seemed to sum up perfectly the spirit of the industry: "We design networks for applications that haven't been invented yet because we believe better broadband means better lives." v Building a Fiber- Connected World The annual FTTH Top 100 list is a window into what's going on in the industry.